Just like out classic Princess, the Sonnet hearkens back to the early days of cycling, when elegance and pleasure took precedent over speed or competition. Have you found the Pashley Sonnet Bliss Cream and Blue Cheaper? With the Sonnet, we have taken this tradition to celebrate our roots in the 1920s and 30s - the beautiful two-tone colour schemes are a nod to the inimitable style of this period. Such a unique look combines with the beauty of our curved frame design to make the Sonnet the eye-catching pinnacle of cycling chic. There are two distinct versions of the Sonnet to meet your exacting needs: The Pure is the simpler and lighter model, with reliable 3 speed hub gears that are perfect for everyday riding, whereas the Sonnet Bliss comes fully-equipped with luxuries such as 5 seed hub gears for all terrains, a handy built-in lock and a front dynamo headlamp to keep you safe at night without the need for batteries. Whichever you choose, the Sonnet is the embodiment of the refinement and class of a bygone age, and will transport you to a world of uncomplicated riding pleasure that is so very rare in our hectic modern world. Mudguards Classic profile steel guards with-hand applied gold lining and rear reflector. Other Features Protective chainguard, large ding-dong bell, wicker basket, classic hub-dynamo headlamp, LED rear light, Pletscher alloy rear carrier, propstand, frame-fitting lock and pump. 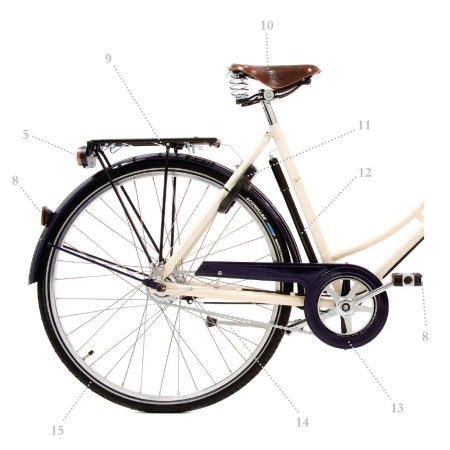 Frame sizes 17.5", 20" or 22"
What do you think of Pashley Sonnet Bliss Cream and Blue?